Last year at this time, 12-year-old Ian Burleson was struggling with almost everything, especially school. Ian has autism spectrum disorder, and like many people with this challenge, he’s subject to meltdowns. Various things can prompt a meltdown, including change and unpredictability. Since Ian was about to make the transition from elementary to middle school — a major change with loads of unpredictability — there was cause for concern. Then a Mutt-i-gree entered the picture, and everything changed. 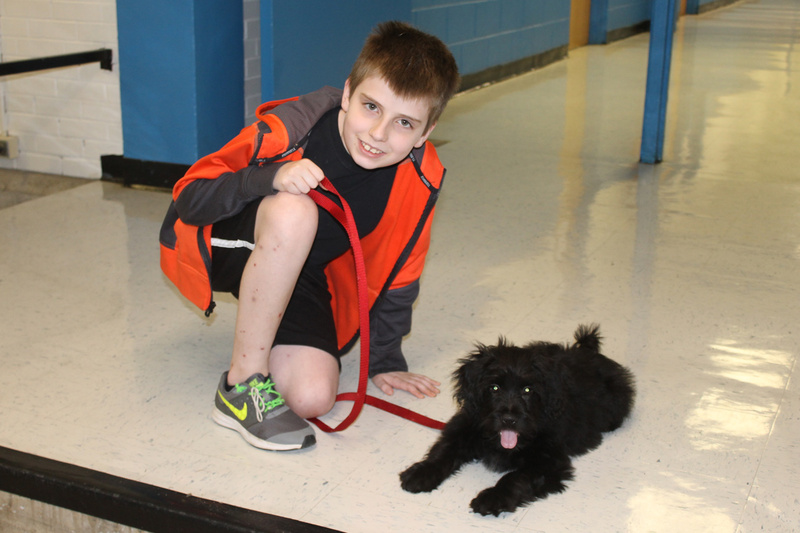 On Ian Burleson’s first day at Harris Middle School in Spruce Pine, North Carolina, a 3-month-old Poodle mix named Ruby was waiting to exert her magic. Ruby is a sweet, well-socialized dog who loves kids, despite her rough start. Last May, she and her two littermates were among 40 dogs rescued from a squalid hoarding situation. Michael happened to be at the shelter on the day that Ruby’s foster mother returned the three puppies, healthy and ready for adoption. Holding Ruby in his arms that day, Michael realized that she would make a fantastic school dog. One thing led to another, and dog-lover Sandy Vaughan, the school’s administrative assistant, adopted Ruby on the condition that she bring the pup to school every day. Now when Ian feels anxious, he requests time with Ruby. Within minutes of being near her, he’s more relaxed. Frustrations dissipate and meltdowns de-escalate. And the amount of time it takes to bring him back to a place where he is ready to learn is cut in half. “It’s been a semester of breakthroughs,” said Michael. Harris Middle School will be the first school in North Carolina to implement the Curriculum, which it plans to phase in during the next few months. When Ian’s teachers heard about the Mutt-i-grees Ambassador program they agreed that Ian would be an excellent candidate.